Sweet. Another installment of Madden is coming out soon. That should make all you football fans excited. You know what's better? This version is a lot more Professional Grade. And that's because GMC is now the official truck of Madden 25, which means in-game advertising just went to the next level. Every single Madden game adds a different level of authenticity to the experience. Sure, the people playing it are still sitting half naked on a couch eating Cheetos (I assume, that's how I play video games) and not actually running up and down a field, but it gets more "realistic" each time. 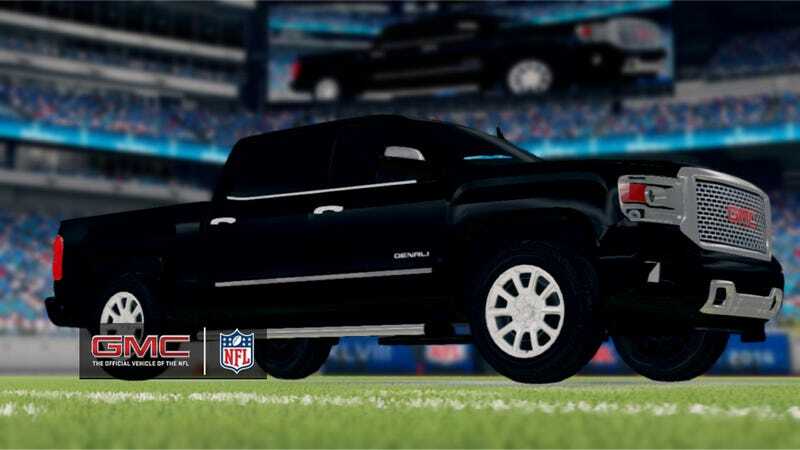 GMC, which is already the official vehicle of the NFL, has now extended this participation into the virtual world. It's a pretty natural extension, and is also the first car to appear in the Madden franchise. It's smart in a few ways. First, it makes the game more realistic by bringing more elements of the NFL into the virtual world. Secondly, and more importantly, it's a one-time ad spend from GMC for at least a year of impressions on one off the largest video game audiences in the world. And when that year is over, everyone will buy a new copy, and if GMC extends that relationship, the updated lineup will now appear to shirtless men on couches year after year. The real challenge will be getting those people off of couches and have them buy trucks.